This can reduce files to ~15% of their size (2.3M to 345K, in one case) with no obvious degradation of quality. Also, remember that dCompatibilityLevel will be overridden by what you choose in dPDFSETTINGS (i.e. : Level 1.3 or 1.4). If you want to choose a specific level it must be done by declaring dCompatibilityLevel AFTER the declaration of dPDFSETTINGS, otherwise, it is unnecessary. This is great. Any thoughts on compression affecting search functionality? After compressing everything looks great to the eye, but if I do Ctrl+F or similar search for text in Mac preview, the matches are very spotty. Other than that, worked like a charm. In my test case, this command destroyed digital signatures in a PDF. @cschwaderer Any processing (modification) will always invalidate digital signatures, that is a principle of digital signatures. I.e. even if they were left in the document (and not removed by ghostscript), the signatures would no longer match with the changed document. That is correct, since the signer did not sign the changed (processed) document, only the original one. thanks '/ebook ' works perfect , big difference in size and marginal difference in quality. I used current ghostscript version 9.25 (2018-09-13) to reduce the size of a PDF that contains hyperlinks to several URLs, as well as hyperlinks to several points inside the PDF. Ghostscript reduces the file size substantially, BUT destroys all the hyperlinks. Any ideas, any hints, please? For me some reason it didn't work . Simply Go to LibreOffice open the pdf file in Draw. 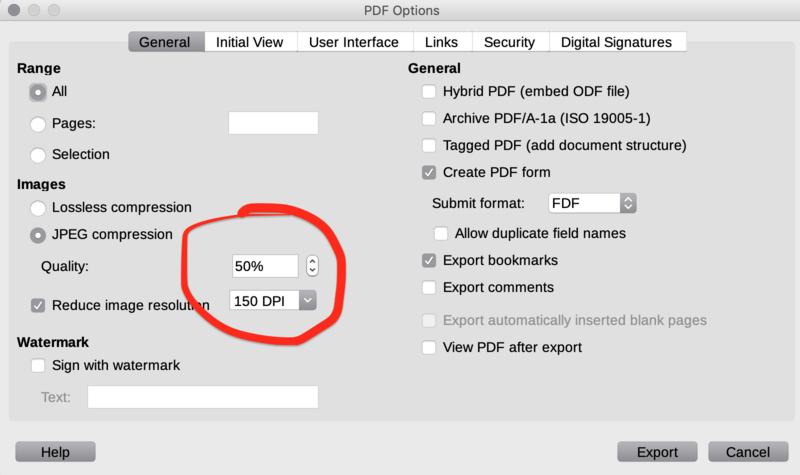 select "Export to PDF" and reduce the DPI to 150 and quality to 50% or so you're done.